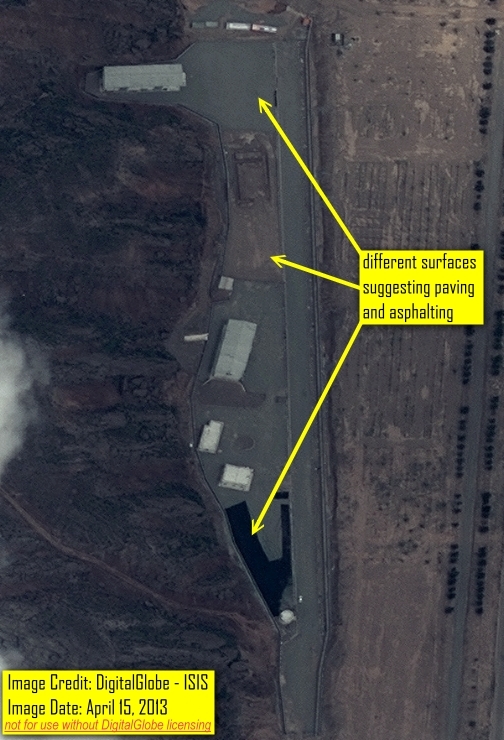 Recent commercial satellite imagery of the Parchin site in Iran shows the extent of new paving as well as the extent of other alternations undertaken at the site over the past year and a half starting in February 2012. 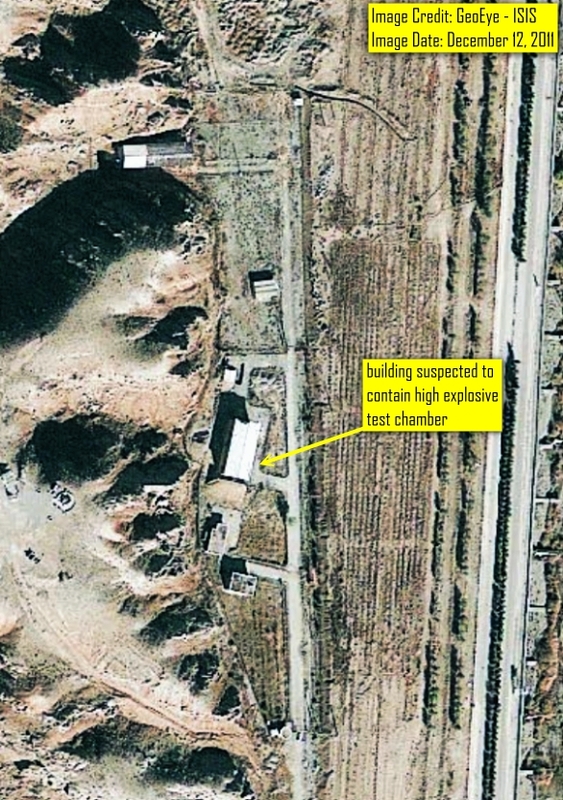 Iran appears to be in the final stages of modifying the suspected high explosive test site at the Parchin complex, having recently asphalted large sections of the site. As noted in several of the International Atomic Energy Agency’s (IAEA’s) quarterly Iran safeguards reports and in numerous ISIS satellite imagery reports on Parchin, asphalting and the other documented activities have significantly changed the site and impacted the ability of IAEA inspectors to collect environmental samples and other evidence that it could use to determine whether nuclear weapons-related activities once took place there. Asphalting an entire area in this manner would make it very hard to take soil samples and likely be effective at covering up environmental evidence of nuclear weaponization-related experiments. Iran in 2003 and 2004 conducted similar concealment activities at Lavisan-Shian, razing and rebuilding the entire site in an effort suspected to be aimed at concealing alleged, undeclared military nuclear efforts. The Parchin site remains of interest to the IAEA due to evidence of pre-2004 activities related to the development of nuclear weapons. Iran is alleged by the IAEA, the United States, and at least three European governments to have had a well-structured nuclear weapons program aimed at building a warhead small enough to fit on the Shahab 3 ballistic missile. Determining the nature and extent of these activities and whether they continued after 2003 is a priority of the IAEA and vital to its determination that Iran’s nuclear activities are truly peaceful in nature and in compliance with the Nuclear Non-Proliferation Treaty (NPT). So far, Iran has refused to allow the IAEA access to the Parchin site or address concerns about other nuclear weaponization-related issues. As a result, the IAEA has been unable to provide a determination that the Iranian nuclear program is of an exclusively peaceful nature. Such an IAEA determination may very well decide whether any agreement with Iran on limiting its nuclear activities is accompanied by significant sanctions relief. The Iranian regime, including its new President Hassan Rouhani, should make finding a settlement to the issue of Parchin a priority in its discussions with the IAEA and the P5+1. As part of that new approach, the Rouhani administration should seek authority from the Supreme Leader to abandon Iran’s past tactics of drawing out negotiations, refusing to compromise during those negotiations on the legitimate requests of the international community, and refusing to be transparent about the nature of its past and present nuclear activities. Recent commercial satellite imagery shows new paving and the extent of alternations undertaken at the Parchin site since February 2012. DigitalGlobe imagery from August 13, 2013 shows that the majority of the area at the site has now been asphalted (figure 1). Most of the ground surface of the site has been asphalted. Only one area within the current boundaries of the site is not covered by asphalting, a patch of ground between the building alleged to contain a high explosive chamber and a second major building to the north.3 It is unclear why this patch of ground has not been asphalted, but imagery analysis indicates that unlike the rest of the site, this specific area was not prepared for asphalting. Previous satellite imagery from April 15, 2013 shows the initial phase of asphalting (appearing in black), the surfaces prepared for asphalting (appearing in gray) and the patch of ground in question appearing to be of a different color and texture (figure 2 ). Preparation work for asphalting began in late winter of 2013 and the work started in late March or early April, as indicated by the April 15, 2013 imagery. DigitalGlobe imagery from May 30, 2013 available on Google Earth indicates that asphalting of prepared surfaces was most likely complete by the end of May 2013 (see figure 3). Comparing the most recent imagery from August 13, 2013 (figure 1) and the earlier May 30, 2013 imagery from Google Earth shows very little change in appearance of the site and limited indications of activity. The only noticeable differences over the past several weeks are water or dirt runoffs possibly due to construction activity or weather (figure 1). For comparison, figure 4 shows the site prior to the IAEA’s initial request for a visit in February 2012. Following this request, Iran started major modification work at the Parchin site, increasing suspicion that it was seeking to hide evidence of past activities. Added a small structure outside the northeastern side of the security perimeter. In fact, the IAEA has not declared Iran to be guilty of being in noncompliance with the NPT but has attempted to gain Iran’s cooperation in dispelling any doubts regarding its activities at Parchin by stating that “it is essential that Iran provide substantive answers to the Agency’s detailed questions regarding Parchin and the foreign expert, as requested by the Agency since February 2012”.6 Far from cooperating with the IAEA’s mandate to verify the completeness of Iran’s NPT nuclear declarations, shortly after the February 2012 IAEA request, as discussed above, Iran undertook radical demolition, earth displacement and construction work at Parchin to fundamentally alter the site and severely impact the IAEA’s ability to conclusively verify that no illicit activity had taken place there. 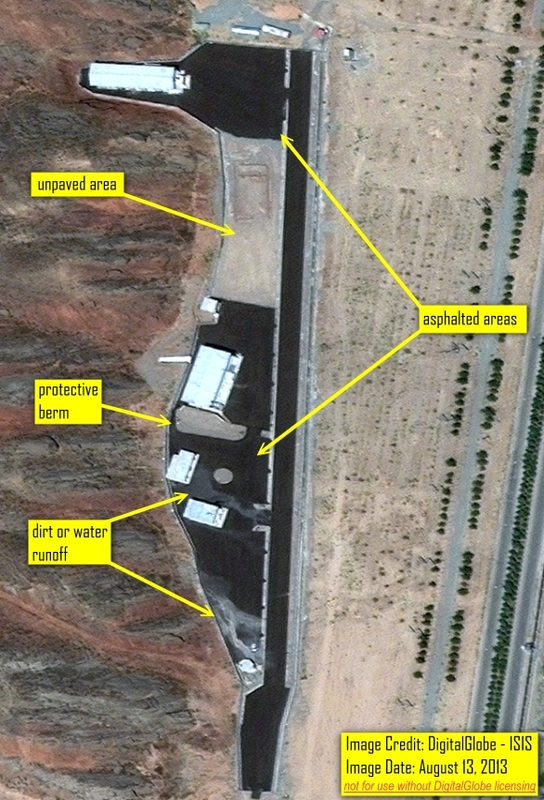 As seen in the latest satellite imagery (see figure 1), one year and a half later, Iran is still in the process of altering the site all the while denying the IAEA access to the site or to related documents and personnel. While claiming to be unfairly judged, Iran has seemingly done everything possible to undermine the claim of its own innocence. This claim completely ignores the year-long, widely publicized international media reports and regular satellite imagery updates by ISIS that thoroughly and clearly document activities at the Parchin site that are completely unrelated to any road building activity. In additional statements in paragraphs 68 and 70 of the letter, Iran quotes the IAEA as saying that “The Agency was given free access [in 2005] to those buildings [located in Parchin] and their surroundings and was allowed to take environmental samples”8 and that “Iran informed Deputy Director General that Iran is prepared to grant access to the location [in February 2012]” but that “the DG [Director General] did not accept these generous offers”.9 Although Iran did in 2005 grant inspectors partial access to two sites in the vast Parchin complex, these sites were located five kilometers away, on the opposite site of the complex from the site currently at issue. The current site at Parchin became a subject of IAEA interest following information assembled after the 2005 visits. Moreover, the claim that Iran has since offered the IAEA access ignores the fact that this supposed offer contained debilitating conditions that would have severely limited the IAEA’s ability to conduct a reasonable investigation and hence was declined by the IAEA. Since February 2012 the IAEA has held several inconclusive meetings with Iran in an attempt to gain access to the site and settle other nuclear weaponization-related issues. Throughout this period, Iran has continued to irreparably alter the condition of the site, severely degrading the inspectors’ ability to determine what has happened there. The letter from Iran has many other fallacious statements and assertions. Overall, the letter is little more than a poorly researched and supported effort to stonewall the inspectors and mislead other governments and the public. The new administration of President Rouhani will hopefully have the wisdom and authority from the Supreme Leader to develop a more honest, productive approach. Interestingly, the recent statement from Iran takes issue with ISIS’s publication of the IAEA’s quarterly Iran safeguards reports, falsely implying that these reports contain secret safeguards confidential information and that somehow the IAEA “leaks” to ISIS. ISIS has for many years obtained copies of this quarterly report from multiple diplomatic and media sources and posted it on its web site on the same day it is sent to member states. This report is not safeguards confidential, and in fact, the IAEA itself makes the report available to the public within days after sending it to member states. The IAEA cannot post the report on its web site under its procedures until the Board meets to discuss the issue. The IAEA prepares these reports as part of its obligation to inform its Board of Governors and the United Nations Security Council about the activities of Iran, and it fully intends to make the information public, thus debunking Iran’s claim about the reports’ sensitivity. ISIS decided several years ago to post the IAEA Iran safeguards reports (in addition to safeguards reports on other countries, such as North Korea and Syria) on its web site as soon as it received a copy, as a service to the media and the public. Other groups and experts also post the report on the same day. ISIS has also for several years compiled and assessed data from the IAEA Iran report in an analysis released on the same day. These reports chart Iranian nuclear progress and setbacks and monitor the number of centrifuges, the number of centrifuges enriching uranium vs. those installed in total, the number of advanced centrifuges, the amount of enriched uranium produced, the average separative work output of the centrifuges, and trends over time. The ISIS reports are based on information reported by the IAEA in its own reports and not on safeguards confidential information. They remain the only technically comprehensive and publicly available assessments on the IAEA’s reports and are widely used by other governments, the media, and the public. Iran, and a few who have reported on Iran’s letter and statement uncritically, have taken issue with this public service. However, we believe that ending this practice would be a disservice to the public debate over Iran’s nuclear activities. The views expressed by Iran and a few others only undermine transparency and promote censorship of critical public debate. Figure 1. 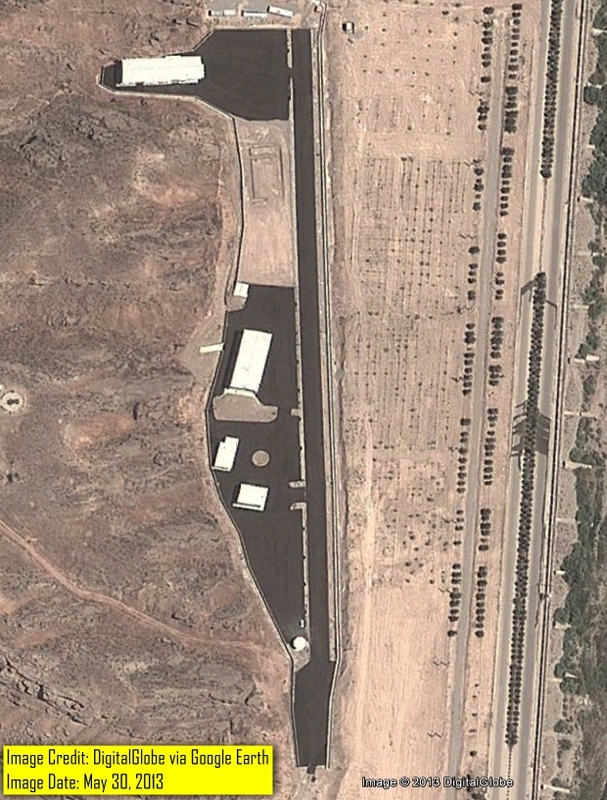 DigitalGlobe imagery from August 13, 2013 showing the extent of asphalting at the Parchin site. An area of considerable size remains unpaved for unknown reasons. Visible water or dirt runoff trails could be due to construction work or weather. Figure 2. Imagery from April 15, 2013 shows the initial section of asphalting appearing in black. The gray surfaces indicate ground that has been prepared for asphalting, while a section between the two major buildings appears to have a different color and texture, indicating that it has not been readied for asphalting. Figure 3. DigitalGlobe imagery from May 30, 2013 available on Google Earth showing the site conditions at the end of the first phase of asphalting. Figure 4. Imagery from December 12, 2011 showing the original buildings, security perimeter and layout of the Parchin site prior to the February 2012 IAEA request to access the site. Following the IAEA request Iran initiated work that resulted in the complete alteration of the internal layout, modification and demolition of several buildings and construction of a new security perimeter. 1 Although ISIS is not publishing a detailed critique of Iran’s recent statement, an ISIS critique of an earlier, similar Iranian statement can be found here: Andrea Stricker, “ISIS Analysis Part II: Iran’s Critique of May 24, 2011 IAEA Safeguards Report: More Obfuscation,” September 2, 2011. Moreover, on the more general question about the IAEA’s legal obligation to pursue access to the Parchin site and a resolution of the nuclear-weaponization issues, see David Albright, Olli Heinonen, and Orde Kittrie, “Understanding the IAEA’s Mandate in Iran: Avoiding Misinterpretations,” ISIS, November 27, 2012. 2 For one possible method to come to a long term agreement in stages, see Table 5. Creating a P5+1/Iran Framework Agreement: Preliminary Suggestions in Albright, Paul Brannan, Andrea Stricker, Christina Walrond, and Houston Wood, Preventing Iran from Getting Nuclear Weapons: Constraining its Future Nuclear Options (Washington, D.C.: ISIS and United States Institute of Peace, March 5, 2012). 3 The imagery also shows a protective berm next to the building alleged to have contained the chamber used for high explosive tests. It would not be expected to be asphalted and other Digital Globe imagery, which is taken at a angle from the vertical, distinctively shows a berm. 4 Stricker, “ISIS Analysis Part II: Iran’s Critique of May 24, 2011 IAEA Safeguards Report: More Obfuscation,” ISIS, September 2, 2011 5Communication dated 10 July 2013 received from the Permanent Mission of the Islamic Republic of Iran to the Agency regarding the Report of the Director General on the Implementation of Safeguards in Iran, July 23, 2013, Paragraph 69, page 12. 6 Implementation of the NPT Safeguards Agreement and relevant provisions of Security Council resolutions in the Islamic Republic of Iran, GOV/2013/27, May 22, 2013, Paragraph 57, page 11. 7 Communication dated 10 July 2013 received from the Permanent Mission of the Islamic Republic of Iran to the Agency regarding the Report of the Director General on the Implementation of Safeguards in Iran, July 23, 2013, Paragraph 69, page 12. 8 Communication dated 10 July 2013 received from the Permanent Mission of the Islamic Republic of Iran to the Agency regarding the Report of the Director General on the Implementation of Safeguards in Iran, July 23, 2013, op. cit., Paragraph 68, page 12. 9 Communication dated 10 July 2013 received from the Permanent Mission of the Islamic Republic of Iran to the Agency regarding the Report of the Director General on the Implementation of Safeguards in Iran, July 23, 2013, op. cit. Paragraph 70, page 12.